Here at therhinos.co.uk we have teamed up with former Rhinos star and England ace Ryan Hall to keep in touch with WBW whilst he is down in the NRL with Sydney Roosters. In our first of a regular feature on the Rhinos official website, Hally tells us about pre-season training with the Roosters, how much he enjoyed the trip over for the Betfred World Club Challenge and how he is recovering from the knee injury that ended last season for him. Plus he talks about the Rhinos start to the season. LIFE IN SYDNEY IS QUITE A BIT DIFFERENT TO LEEDS, THE MAIN THING IS THE CLIMATE OBVIOUSLY. Whilst the playing seasons run parallel it is the opposite when it comes to pre-season. I am used to doing preseason in the cold and wet but it is in the summer time over here. Doing that sort of training in the summer is a different mental game. Back home you spend time getting your fingers warmed up so you can catch a ball but here you try and drink enough water so you don’t pass out. For me personally it is great to get into a pre-season. Most of the time I was at Leeds, I was with England so my pre-season time was reduced significantly. I would maybe only done four weeks in pre-season for the last decade, you are just getting your body moving again after your time off and then you are into matches. Because of my injury I have had the full benefit of pre-season. I was first back in training with the young lads. Naturally they are very enthusiastic and me and Brett Morris were the grumpy older ones! However, their enthusiasm rubs off on you and I am training like a young ‘un again. A few weeks later, the more experienced players started and the average age rises up a bit. We then start playing games rather than just getting fit, which is enjoyable. It has certainly freshened up things for me after 12 years at Leeds and I do feel like a young kid again learning the new systems. My knee is coming along nicely. As text book recoveries go, I am tracking well and hitting all the milestones I am supposed to do. The surgery was good and it is strong and stable now need to build up strength and pain free in my knee. I am enjoying working with Trent Robinson, he is similar to Tony Smith in the way he views the game and things he works on. The Roosters squad are a really good bunch of guys. Brett Morris was in on the first day with me and has been a big help. He is a humble guy even with the great reputation he has over in NRL because of what he has achieved. You can see why he has played as long as he has because he does all the right things. I spent the first month with him and he was good at giving me tips about training over here and what is expected from you. 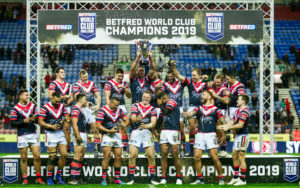 Sydney Roosters’ celebrate winning the World Club Challenge. The World Club Challenge trip was very good. We went to Paris and took him some history on the Western Front. Trent is keen to expose the players to new experiences and the trip was a great opportunity to do that. Not many of the lads had left Australia before. I was a bit of a tour guide, speaking my best French which is saying something! I was really thankful to be included in the travelling group. When I first knew about the fixture I pretty much wrote it off but when Trent said he was going to take me with them to get to know the lads, it was great to see a bit more of them away from the rugby field. We lost out to Souths in Round One but no one is getting too downhearted. It is a long season. That was only round one and things will not always go to plan. We’ve looked at the game and the things we need to fix up were pretty obvious. Souths are a good side and you need to be on your money when you play them. The lads are still in good spirits and I am sure we have got a good enough team to turn it around. It was great to see my England team mate John Bateman make such an impact on his NRL debut. His name is still kind of unheard of over here but I was telling the lads what to expect. There was a great moment when he dummied to throw the ball in an opponents face and then burst out laughing and that summed him up perfectly. You love him when he’s on your team but hate playing against him, a bit like Ryan Bailey used to be like when he was at Leeds. I still keep in touch with Super League and watch the live games every week. Saints are playing really well and Cas and Warrington are doing well too but obviously things are not going too well for Leeds at the moment. It has been hard to watch, as I can see a lot of my mates trying their best and its not working at the moment. It is a long season, 29 league games to sort your final position out. I have full confidence that we will be a different position come the play offs. I am sticking with the lads. I know the talent we have got and I know they will turn it around but it is hard watching at the moment. I’ll be hoping that my old mate Brad Dwyer can start getting over for a few tries so QDeck can get some advertising on social media and on the big screen! Away from the rugby, I am settling into the Australian lifestyle. I have got my barbecue on the balcony and it is always on for dinner. When I first moved over I had to borrow the club ute and felt like a proper Aussie cruising around in that! Having said that, I am trying to be full Yorkshire whenever I speak and trying my hardest not to start using Aussie slang. From experience, every time we meet up in the England camp and one of the NRL lads uses an Aussie term they get ridiculed so I have been resisting picking it up and getting into bad habits! It is great that the Great Britain tour has been announced. For me personally there are a lot of hurdles I have to jump over before I can think about that. The first step is getting my knee right and playing to my potential with the Roosters. The incumbent Test wingers from last year were outstanding with Jez McGillvary carrying on his form from the World Cup and Tommy Makinson winning the Golden Boot so that will make it hard to break back in. I just need to take it one step at a time. Great insight to big Rhino, thanks RP. I walked past him last Friday night at the game and of course started a conversation. He was telling me he had never had a serious injury before he did his ACL. He signed with the Roosters then about a week later got injured. He looks big and strong, I can see him doing the Fergo role when he is fully fit. Did anyone else read that in an English accent? Great piece - thanks for posting. Sounds like a good man to have around. Can’t wait to see what he does for us. > When I first moved over I had to borrow the club ute and felt like a proper Aussie cruising around in that! Fark I hope he plays well with us. Yorkshire. Yours is more correct however, as Leeds is in Yorkshire. All times are GMT10. This page was generated at 09:14 PM.